of the Western Provincial Council at the first draw of Ceylinco Life’s ‘Family Savari 5.’ Ceylinco Life Category Manager, Upul Adikari is also in the picture. Five families celebrated their fortune this week when they learnt that they were the first set of winners of a fully-paid holiday in Singapore, courtesy Ceylinco Life. 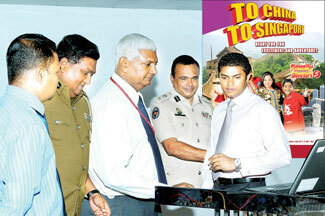 The five families from Beliatta, Dambulla, Badulla, Wennappuwa and Pilimatalawa will be joined by 45 others selected through a series of monthly draws which will culminate in the fifth Ceylinco Life Family Savari, including visits to China, Singapore and a day's outing at Leisure World, in 2012. The first draw for this latest edition of Ceylinco life insurance annual promotion was conducted recently which also involved the selection of the first 20 families that will be invited to spend a day at the Leisure World theme park in Avissawella.